Real muscle--real fast, nothing beats advanced Max Contraction Training! "Groundbreaking. This is truly an incredible discovery that could cause physiology books to be rewritten." "[John Little's] methods . . . will result in real, meaningful, and sustainable physical results and will help build a confidence in your own abilities that will permeate into all areas of your life." "This training approach has begun to stimulate our thinking in entirely new directions." "Don't be surprised if you see substantial results in only three workouts! That's how good this system is." Get huge in record time! With Omega Set training you can gain as much as 18 pounds of lean, hard muscle in as little as 4 weeks--without fad diets, supplements, or anabolic drugs. 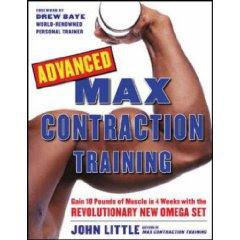 Taking bodybuilding pioneer John Little's Max Contraction Training to a whole new level of intensity, this science-based system is specifically engineered for advanced bodybuilders who demand results measured in pounds and inches of pure muscle.